When it comes to illustration on the computer, artists have had few choices: Scanning, which requires touch-up work (and, if necessary, vector traces); drawing with a mouse or trackpad; or, the most-appealing so far, working on a tablet or pressure-sensitive display. Wacom’s Inkling, announced Tuesday, hopes to eliminate these intermediary steps and bring artists back to their roots: drawing on pen and paper. Like Livescribe’s Echo Smartpen, the Inkling is a digital sketch pen and receiver; sketch, and your lines will be translated into an illustration on your computer. 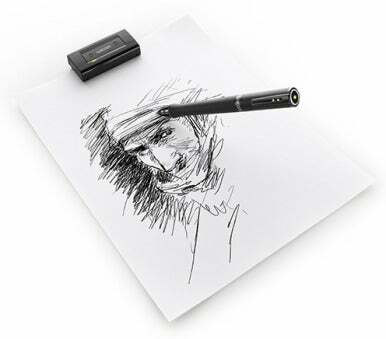 Unlike the Smartpen, however, you don’t need special paper to record your drawings; you can attach the Inkling’s receiver to any paper surface and scribble away. The receiver will record all pen movements made on an A4 paper area (8.27-by-11.69 inches), though you can mount it to a larger piece of paper. Wacom’s pen has the company’s signature 1024 levels of pressure sensitivity built-in, so that all your line widths transfer accordingly. If that weren’t enough, you can create multiple “layers” while you sketch by tapping the Layer button on the receiver; when you import your sketches, these will translate into layered files in Adobe Illustrator, Photoshop, and Autodesk Sketchbook Pro. If you forget to add a layer during the drawing process, you can use Wacom’s Sketch Manager software to scrub to a certain point in your drawing and separate that section. Once you’ve imported your drawing, you can also play back any drawing you’ve made, stroke-by-stroke (perhaps cribbing a move from one of my favorite iPad sketching apps, Brushes). If you’d prefer not to use Adobe’s suite or Sketchbook Pro, you can open drawings on your computer in a variety of flattened formats—JPG, BMP, TIFF, PNG, SVG, and PDF—for reference or for use in another image application. Inkling will be available in mid-September from Wacom and Amazon for $199; to export drawings, you’ll need a Mac running OS X 10.4 or later, or a PC running Windows XP SP3, Vista, or Windows 7. And if you can’t wait to get your hands on Inkling, you can amuse yourself by watching these lovely step-by-step tutorials that Wacom has made about the product.